The Nokia 3710 is a sleek-looking flip phone available in plum, pink and black colours. It has a talk time of four hours and has a high-efficiency charger. The main display size is 2.2" and the secondary display on the cover is 1.36". The main display has 16.7 million colours and the secondary display has black and white. It has a numeric keypad and volume control buttons on the side. With its rounded edges it's quite an interesting new model from Nokia. The Nokia N900 is a model that will appeal to young executives. It has a slide out full QWERTY keyboard. It has a 65 colour touch screen and the talk time exceeds six hours. 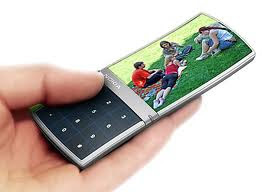 It has a five mega pixel camera and all the latest features that you would expect from a mobile phone. The Nokia E72 has the full QWERTY keypad on the front panel of the phone. It has a TFT display with 16M colours and optical track pad. The talk time is over twelve hours. It also has a five mega pixel camera. It has all the latest features that you would want in a cellphone. The Nokia X6 has a 3.2" display touch screen and a 5 mega pixel camera. The touch screen can be rotated and it has a talk time of over 11 hours. Like all other latest phones from Nokia it has all the possible features that you would want in a mobile phone. It does not have an additional memory slot. It has 32GB of internal memory which is quite sufficient. Another phone from Nokia in the X series is the X3, which has a 3.2 mega pixel camera and a 2.2" screen. It has a talk time of over seven hours and all other standard features of mobile phones. The Nokia 6760 slide is another latest mobile phone from Nokia. It has a full QWERTY slide out keyboard and a 3.15 mega pixel camera. It has talk time up to 3 hours and all the other features that modern mobile phones have. It's available in black, red and white colours. The Nokia N97 is a very interesting mobile phone that's packed with features from Nokia. It has a slide out full QWERTY keyboard and the screen can be tilted up when replying to emails. It has a 5 mega pixel camera and a talk time that's just over seven hours. These are some of the latest Nokia mobile phones and they have enormous data storage facilities, fast processors and different connectivity types. You can download songs, listen to FM music on the radio and all of them have browsers to send and receive mail.